The Bees decided to brave a new frontier this weekend-going to see a movie in prime time. (Small aside- um never again- they wanted to make us pay $26.50 for the four of us! I looked at the clerk and said to her- "My son is under 2- do we really need to pay 6.50 for him to see the movie?" The answer was no- fortunately, and he got in free.) We went to see Cloudy with a Chance of Meatballs (side note- adorable, definitely a must see for families with young children). I was impressed with my children's behavior, especially Jacob, who, as a 23 month old, sat still the whole movie, giggling and clapping, even saying "oh no!" in his adorable voice. We were very proud of him, and he totally did NOT say "I fahrted, Daddy", in his cute little voice during a quiet scene. My older son, Drew did NOT actually fart really loud, the sound accentuated by the hard plastic of the booster chair. I hope this child looks at his first born as lovingly as he did this tattoo. 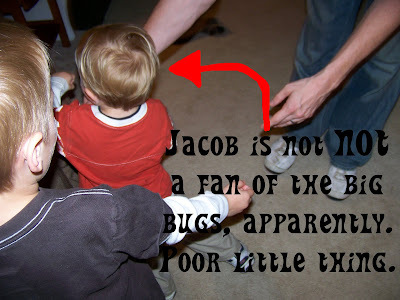 Jacob did NOT run away and cry in fear of the big bug on Drew's arm. Of course the Mommarazzi was there to take the picture of him running. Then, the next day I cooked a big spaghetti dinner for Sunday night- Jacob did NOT use the spaghetti sauce for body paint, nope, not at all! For these reasons, I was NOT excited for bath night tonight. No, I really mean that, although I guess you could say I was excited for the outcome of the bath night. Mr. Bee gave them a bath, which was NOT a total relief. I so did NOT give Mr. Bee a big smooch when I saw that he had managed to rub that bug tattoo off. Score +10 points for Mr. Bee! This blog carnival was created by MckMama.Go head over to her blog to read what she and everyone else have not been doing this week. stopping by from SITS! Love the tatoo can't believe how real it looks! have a great day! The tattoo was great! I also loved the term momerazzi! That is awesome. hmmmmm...did you feed the boys lots of onions before the movie. That's what normally triggers the fharting around these parts. I am in awe of you attending a movie during Prime Time -- what - are you nuts?????? That tattoo is freakishly real looking. Ick! I just may have to brave the movie theater with our two younger girls. And congrats on making the #1 slot on MckMama's blog! Way cool kids tatoo!! Good tip on the movie - I think we're going next weekend and I wondered how it was. Hi from sits! I voted for your kiddos! I'd love if you would stop by my Blog For A Cure Blog Party, going on all week long at www.whoknewreviews.blogspot.com. Its a great way to get new followers, win some prizes, and support the Leukemia and Lymphoma Society! Aw, lol. I loved your post. That tattoo looks so real! Well, hi from SITS as well! I can NOT make you cry so here I am commenting, and I am certainly not perusing 200 hundred blogs in order to avoid doing dishes! Nope...not me. I wish I could type faster, now that I think about it! 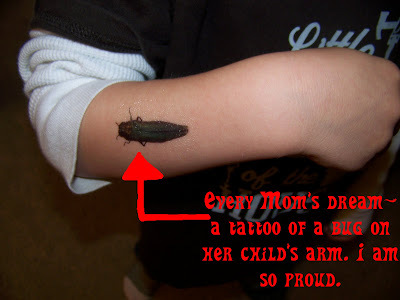 That bug tattoo looks really real and creepy! I'm with Jacob on this one!!! And I love the book "Cloudy with a Chance of Meatballs" and would totally see the movie but my son (5!!!) thinks movies are too loud and won't go.